The refugees are not the only illegals on Lesvos. Many birds, unseen and without passports, cross the Aegean to land in Sappho's birthplace. On the other side of the sea, there are plenty of Turkish nature parks from which also birds take a short flight to nose about this beautiful and quiet island. In spring a large, international army of birdwatchers, armed with cannon-sized cameras, wait for the migratory birds along the island's coastlines. While even in autumn there are plenty of illegal arrivals, November becomes less popular with both birds and their admirers. The continuing warm and sunny weather might be to blame for still encountering those large brown and yellow European hornets (Vespa cabro), which slowly move through the air like old drunkards. I also met a fat, dark brown caterpillar, armed with a horn on his head, who was looking for an escape from of a gang of snails that were boozing away on the rich dew of these autumnal days. These days the best wildlife can be seen around the Gulf of Kalloni, where the saltpans at Skala Kallonis and Skala Polichnitou attract many birds like black storks and lots of flamingos. I wonder if this year the flamingos received a travel warning for Lesvos: in the midst of September there were none to be seen and now there are just a few daredevils swinging on one leg. There is no reason why they should be afraid of refugees: these people do not land in the saltpans nor do they shoot birds out of the sky. Because they are big and fat, pelicans appear far more sturdy than those fragile white and pink acrobats. They seem to have ignored whatever brought about the absence of so many flamingos and probably just think: “What luck not to have any competition for all those shrimps!” Last week there were as many as 44 Dalmatian pelicans and 4 White pelicans lounging on the Gulf of Kalloni. There are plenty of Greek villages that cherish a pelican as an inhabitant. This was the case on Lesvos. 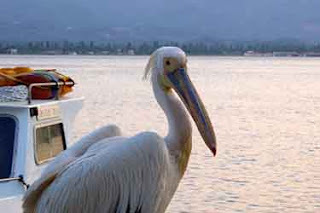 In Skala Kallonis there used to live a couple of pelicans, spoiled by tourists and islanders, but one of them died in a car crash and a few years later the partner also disappeared. In Skala Loutron there used to live another one, I've no idea what happened to him. I say: grant all those pelicans a residence permit, give them a house and plenty of fish, because the island could use a new tourist attraction. It will be a pity to send them back to Turkey. The presence of a Monarch butterfly (Danaus plexippus) on Lesvos will – I am afraid - only attract some entomologists. In America these Jugenstil-like winged insects are a common butterfly, but on Lesvos they are as rare as a refugee on the North Pole. Now that most of the migrants coming to the island are from The Middle East, this butterfly may even have come all the way from Africa. Two of them have been detected in the Mesa swamps. (Asclepias). These lengthy flights often prove lethal: the elderly can tire and just drop down and it may occur that only a new generation reaches the final destination. Friends who last week observed all those winged immigrants on the island came up with another strange bird: The Black Throated Diver (Gavia arctica). The second word in the Latin name gives away their natural home: in the northern cold areas. What is this exotic striped bird doing on Lesvos in such a warm month? I am not one to gossip and I'm not suggesting that this duck is distributing flyers discouraging the refugees from coming to Sweden or Denmark; I have no respect for these flying activists. It is more likely that these swimming birds are also economic immigrants or, taking advantage of the low presence of flamingos, they all booked cheap holidays to Skala Kallonis. It is fascinating to learn that more birds than tourists travel around the world. Just like all other animals they have the right to cross borders without restriction, unlike human beings who need a passport to cross any border. And even then, there is no guarantee they will be able to continue to their final destination. Sometimes it just might be better to be a bird.